A Deployment diagram shows how and where the system is to be deployed; that is, its execution architecture. Hardware devices, processors and software execution environments (system Artifacts) are reflected as Nodes, and the internal construction can be depicted by embedding or nesting Nodes. Deployment relationships indicate the deployment of Artifacts, and Manifest relationships reveal the physical implementation of Components. As Artifacts are allocated to Nodes to model the system's deployment, the allocation is guided by the use of Deployment Specifications. You generate Deployment diagram elements and connectors from the Deployment pages of the Toolbox. 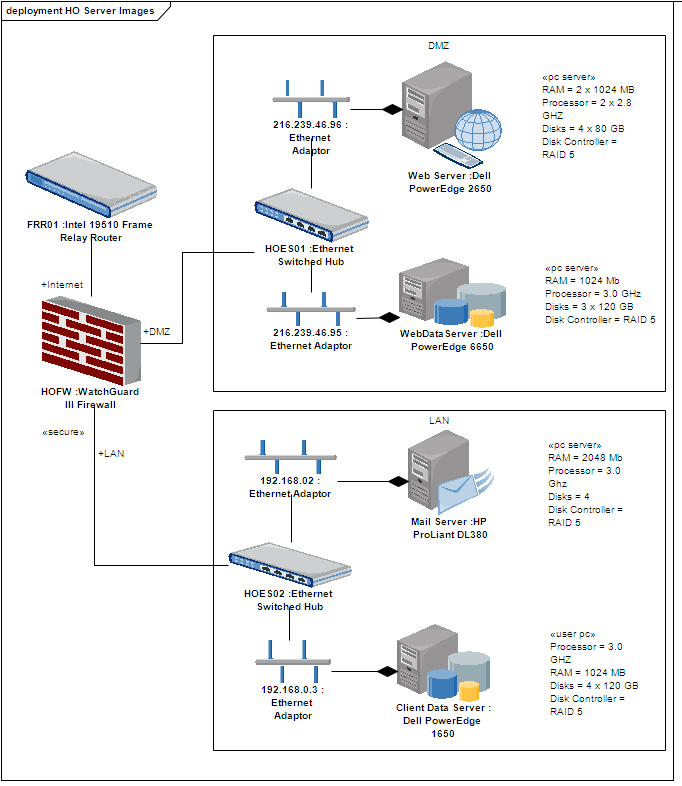 This is a simple Deployment diagram, representing the arrangement of servers at a head office. The servers are represented by Nodes linked by either simple or aggregate Association relationships. A Node is a physical piece of equipment on which the system is deployed, such as a workgroup server or workstation. A Device is a physical electronic resource with processing capability upon which Artifacts can be deployed for execution, as represented in a Deployment diagram. An Execution Environment is a node that offers an execution environment for specific types of components that are deployed on it in the form of executable artifacts. A Component is a modular part of a system, whose behavior is defined by its provided and required interfaces. An Interface is a specification of behavior (or contract) that implementers agree to meet. An Artifact is any physical piece of information used or produced by a system. A Document Artifact is an artifact having a stereotype of «document». A Deployment Specification (spec) specifies parameters guiding deployment of an artifact, as is necessary with most hardware and software technologies. Packages are used to organize your project contents, but when added onto a diagram they can be use for structural or relational depictions. An Association implies that two model elements have a relationship, usually implemented as an instance variable in one or both Classes. 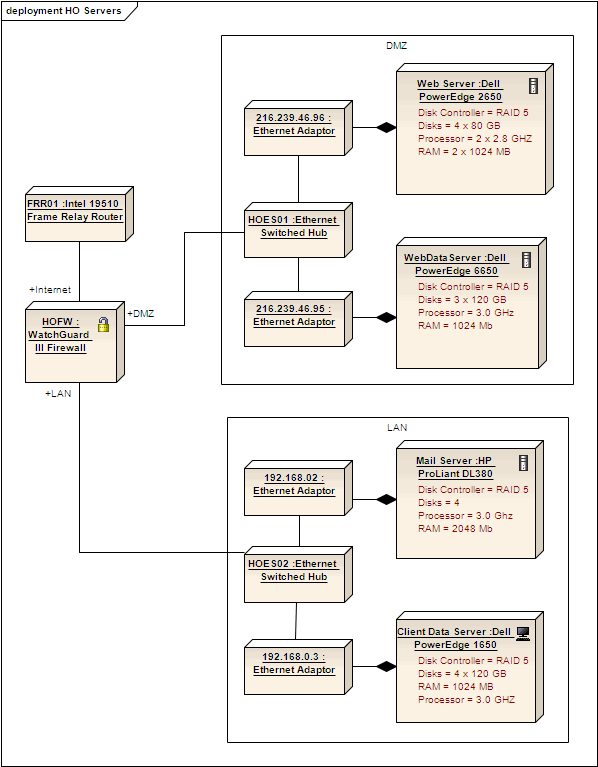 A Communication Path defines the path through which two DeploymentTargets are able to exchange signals and messages. An Association Class is a UML construct that enables an Association to have attributes and operations (features). A Generalization is used to indicate inheritance. A source object implements or Realizes its destination object. A Deployment is a type of Dependency relationship that indicates the deployment of an artifact onto a node or executable target, typically in a Deployment diagram. A Manifest relationship indicates that the Artifact source embodies the target model element, typically in Component and Deployment diagrams. The Nesting Connector is an alternative graphical notation for expressing containment or nesting of elements within other elements.